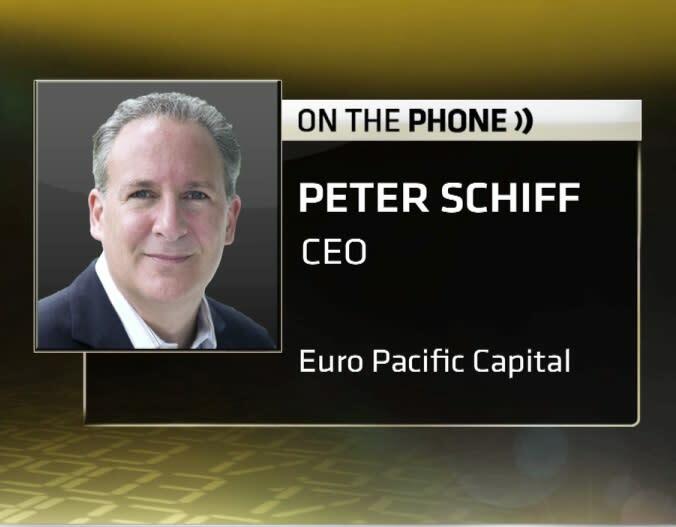 Peter Schiff, CEO of Euro Pacific Capital, gives his reason why stocks could move higher. And, why that reason is bad for the economy. Is the Dow Jones Industrial Average worth 16,000? How about 18,000? "My data shows that the actually fair market value based on current earnings for the Dow is probably around 18,000. Now, it doesn't mean we're going to get there right pay way or we're going to get there in a straight line. Boy, we've had a long time without even a 10% correction. But I don't think this bull market is over yet. I still think there [are] good gains to come." Here's the strange part: Peter Schiff, CEO of Euro Pacific Capital, thinks Siegel isn't far off when it comes to pricing the Dow. But, Schiff notes the difference between valuations and price. And for that reason, he believes the Dow's price may well get to 18,000 even if its value isn't there. "I think the Dow is overvalued where it is now," says Schiff. "But, that doesn't mean it can't go higher. I think what's driving the Dow is the Fed's bad monetary policy, not a good economy or strong earnings. And, that bad monetary policy unfortunately is going to continue. So, I think the market is likely to trade higher, although we could have some corrections." But, in the long-run, the economy is in trouble because of the Federal Reserve Bank, argues to Schiff. He sees a cycle of bad economic numbers prompting more monetary stimulus from the Fed ("quantitative easing" or "QE", whereby the Fed buys $85 billion per month in bonds to add dollars into the financial system). That boosts stock prices but hurts the economy, according to Schiff. "The economy is going to continue to deteriorate because of QE," says Schiff. "And, because the economy deteriorates, the Fed will do more QE. So, that's good for the markets but it's bad for the overall economy." Schiff says the main beneficiaries of QE have been Wall Street's large institutions and the wealthy. Their gains come at the expense of smaller businesses and the average person. Schiff maintains that, thanks to QE, large companies are able to take advantage of the cheap money that lower interest rates create by issuing bonds. Small companies, however, don't have that luxury. "It's easy for these big companies to sell bonds to buy back stock," says Schiff. "But, if you're a small business on Main Street and you need to expand and buy more equipment, there's no credit for you. You can't do that because all the credit is being misdirected by the Fed to speculative activity or housing and it's not going to where the economy needs it. So, we can't create real economic growth. We can't create real jobs." Watch the video above to see the rest of Schiff's interview on why he thinks quantitative easing may be helping the stock market's prices but not the economy as a whole. Dow Jones Futures: Watch These 5 IPOs; Did You Fall Asleep On Tesla?